When I first decided to add SleepPro to my list of mouthpieces to try, I was not quite sure which one to buy. I ended up ordering Easifit for myself and the Woman version for my wife. So, this review is for these two anti snoring devices, which are pretty much the same except that the version for women is designed for the average female’s mouth. To fairly evaluate SleepPro’s, mouthpieces, it is important to be aware of all the advantages and disadvantages associated with it. There are a variety of products to choose from. Easifit uses boil-and-bite to achieve a custom fit. Airflow holes allow device to be worn by mouth breathers. The device is backed by 30-day money back guarantee. Manufactured by an established company that was founded in 1998. Many payment methods to choose from including PayPal and Amazon Payments. There is no way to know what material it is made from. There is no mention of it being BPA- or latex free. Rinsing, cleaning, or soaking in water that is too hot will make the material rough and uncomfortable. Device is bulky and uncomfortable to wear. SleepPro will likely cause drooling and soreness while your mouth gets used to it. There is no available company address other than a P.O. Box. 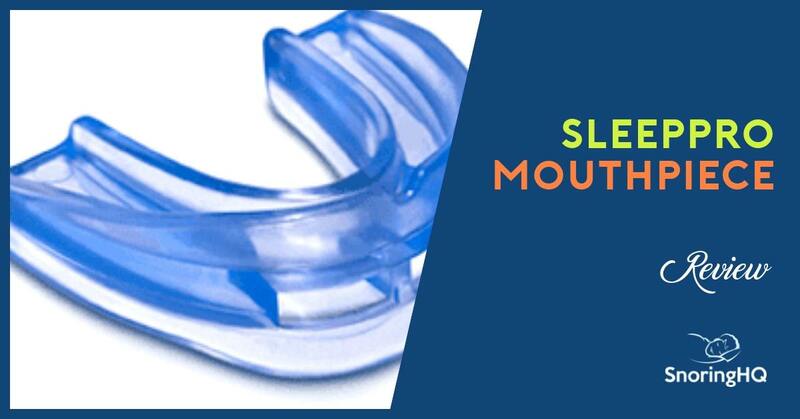 Supposedly, the snoring mouthpiece will ruin faster, if not cleaned using a specific SleepPro cleaning product. There is no option to adjust lower jaw placement. I would have been thrilled if SleepPro would have worked for me, but it didn't. I like that the Easifit model is blue and my wife loved that the lady's version is pink. However, nothing about it is comfortable or thoughtful. Overall I think there are better snoring mouthpieces available. 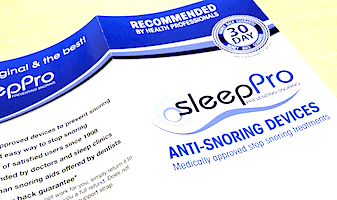 The first thing you see when you arrive to the SleepPro site is that it is medically approved to stop snoring. This pretty much sounds like the device has been put to the test through medical studies, right? Well, not quite. What that should say is that SleepPro is a mandibular advancement device (MAD), and that MADs have been proven effective to work. This certainly does not mean that all MADs work or that there are any clinical trials to back up this statement. As mentioned, SleepPro is an MAD, so it is designed to help you stop snoring by holding your lower jaw in a forward position. By doing this, the airway remains free of obstruction. SleepPro Standard uses the boil-and-bite technique to achieve a custom fit, and this is done in the privacy of your own home. It does have an airflow hole in front, so if you are a mouth breather, you will have no problem breathing normally while you sleep. It does not allow for lower jaw adjustments, which is not necessarily a deal breaker. Some MADs are great without being adjustable. Unfortunately, there is also no mention of what material is used to make this device, which is a little concerning, considering some stop snoring mouthpieces are made of material that contains BPA or latex. 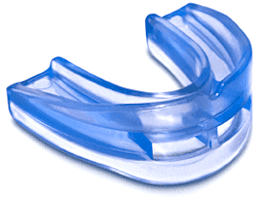 The mouthpiece is backed by a 30-day money back guarantee and a 45-day warranty. As mentioned, I decided to try the Easifit model because that is the one that can be custom molded at home. 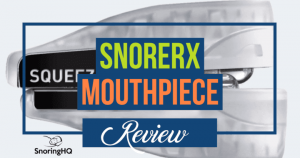 The Contour model was a little too pricey and I didn’t feel like waiting for the lengthy fitting process of the Custom model, so this review is based solely on the Easifit, which is SleepPro’s most popular mouthpiece. I did also order the lady’s version for my wife, which is a little narrower for a smaller mouth. When they arrived, I cleaned them both using a denture cleaner. The instructions say not to use toothpaste. They also say that using a denture cleaner too often will degrade the plastic. What type of plastic is this that it can’t hold up against denture cleaner? I have used an effervescent tablet on pretty much all of the mouthpieces I have tried with no problem. SleepPro does sell its private line of effervescent cleaning tablets, which seem to me to be the exact same thing. I will say that before we even used the boil-and-bite method to fit these mouthpieces we both commented on how large they seemed. They are really quite bulky. They appear to be far more streamlined on the website. The fitting process was easy enough, but we had both used the boil-and-bite method many times in the past, so I’m quite sure anyone will have an easy time achieving a custom fit. We were both “satisfied” with the fit on the first try but certainly not blown away in the comfort department. On the first night we put them in and just looked at one another. They just feel so big, and within seconds we were both drooling. Usually my wife will stay up and read a bit while I go to sleep, but we both had to be up extra early the next day, so it was lights out at a decent time. Boy, did we pick the wrong night to start a new trial on. I watched the clock for a long time. Every once in a while my wife would let out an exaggerated sigh, just to let me know how displeased she was. She eventually took it out and tossed it on the nightstand. In the morning, I felt exhausted. My mouthpiece was on the floor. I clearly hadn’t slept well and at some point my SleepPro either fell out or I took it out in my sleep. At the breakfast table, our teenage son made a sarcastic remark, wondering when we were going to stick with a mouthpiece that works and stop torturing him. Before we went to sleep the second night we decided to do the molding process again, just to be sure we had the best possible fit. I can’t say how my wife’s felt, but mine felt exactly the same. The next night, my wife fell asleep before me (she must have been really tired), and sadly there was no improvement. She was snoring just as loud as she usually does. I finally elbowed her and told her to take it out and put her ZQuiet in. There was no point in both of us being tired, and if I was going to lie there counting sheep, I didn’t want to listen to her snore. Sometime in the early morning hour I took mine out so I could sleep. I have to be honest; I didn’t give SleepPro a full week trial. I actually lasted through night four, so the fifth morning I was done. SleepPro Easifit may work for some people, but it certainly did not work for us. SleepPro Easifit was $44.95. Shipping varies based on your location. A two-pack is also available for $64.95. The mouthpieces are backed by a 30-day money back guarantee. If you go with one of the more advanced options you will be interested to know that the Contour model is $129.95 and the Custom option is $259.99. As mentioned, SleepPro also sells other products, such as chinstraps and effervescent cleansing tablets. SnoreRX and VitalSleep would be better options in the moderate price range. If you are willing to spend just a bit more then go with ZQuiet. You don’t even have to pay the fee upfront. You pay for shipping and then the price gets charged to your card in 35 days, so you have plenty of time to try it out to see if it is the right option for you. Well worth a buy. Does it exactly as promised and easy instructions to follow. Buy one now to solve snoring. Boom! I have owned several SleepPro Customs, (formerly known as the SleepPro II). Although the lead time is lengthy due to the mold being shipped to and device being delivered from the UK, it is BY FAR the most comfortable device I’ve tried. Because it’s custom molded to my own mouth, it is a perfect fit and less expensive than an identical device from my own local dentist. That’s the GOOD news. The BAD news is that the most recent two I’ve had didn’t last more than 3 months. I am a “grinder” and have been for years. My earlier Customs/SP IIs never had this issue but my most recent two have separated on one side, rendering the Mandibular Advancement essentially useless. I strongly suspect they changed their manufacturing process although they won’t admit to it even after repeated questions and one “warranty replacement.” Your mileage may vary but, strictly from a COMFORT perspective, I’ve found none better. If you are a grinder like me, the VALUE perspective is essentially zero. If you are NOT a grinder, then this device is excellent. BTW, their “special cleaner” is nothing more than generic label “efferdent” tablets which are locally and cheaply available. Although I rinse mine after every use, about once a month I clean mine with an old toothbrush under running water (nothing on the brush) and then a soak in efferdent/similar. Thanks for sharing your experience Kevin! Could you try and educate the general snoring market, BPA is NOT something that is added to mouthpieces, it’s an additive in clear rigid plastics to keep them clear. It would never be included in mouthpiece plastics. It’s like saying “does not contain mercury” it would never be included anyway, BPA is a not a concern, it does not go into these products period!